d. 20% Off on services at The SPA Wellness. 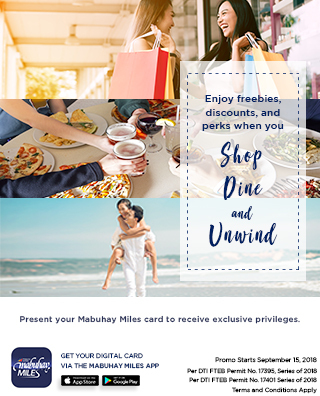 Members must present their Mabuhay Miles card at the Front Office of The SPA Wellness outlet to avail of the discount. 3. Discount can be availed from January 15, 2019 to June 30, 2019 only. 7. Net prices are inclusive of taxes and service charge. Per DTI FTEB Permit No. 0186, Series of 2019.